A Summer Week in Raleigh! We met Mary in an earlier post. 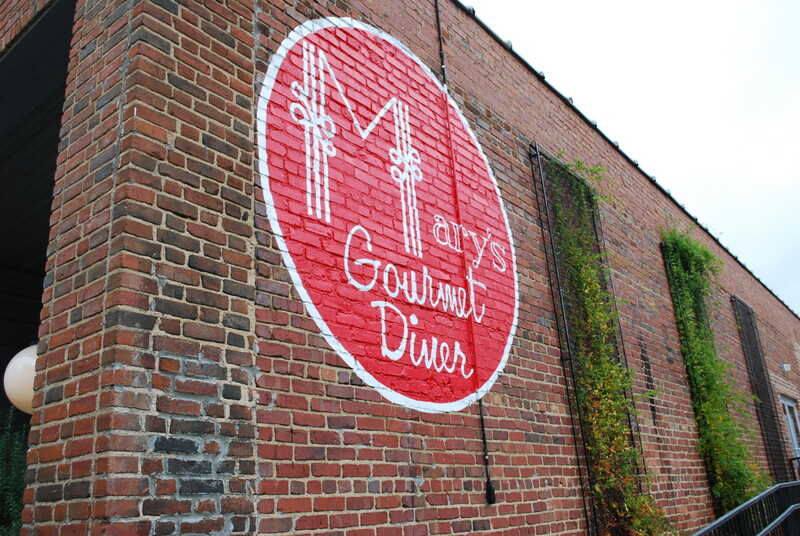 Her restaurants, Mary’s Of Course and now Breakfast of Course (recently renamed, Mary’s Gourmet Diner), are beloved in Winston-Salem. Mary is grateful to be working in a business she loves while employing her family and many others. Below, she gets real about the ups and downs of the restaurant industry and about being a business owner. Did you always want to start a business? I wanted to have a restaurant. We used to play restaurant when we were kids. We didn’t eat out much, so it was a treat. I’ve always worked in restaurants because it was easy to come and go with children. With time, I learned how to cook; my mother taught me frugality. Then I started to work in restaurants that were into fine dining, where I learned from chefs. Thirty years ago I decided wanted to open a restaurant, but I didn’t have money. There was no way. I was in my early forties, and I was waiting tables and making good money doing that. In terms of my dreams, I had two: one was to open a restaurant. The other was to get a degree and help people with substance abuse problems. So I went to a tarot card reader and told her these two things. And she said, “let’s look at them.” The reader said that I would be successful in both, but the restaurant was a blessed venture. But I ignored it and went to school. And yet, I still wanted to open a restaurant. I bugged my parents to put up something for collateral and began to look for a location, but I couldn’t find anything. It was hopeless. So I gave up looking and went back to school. Then a friend came to me that owned a café and said that she would like to sell her café so she could get a medical operation. So, that’s what I did. She got her operation, I got the restaurant. My parents put up their apartment building for collateral so that I could get the loan, which is really awesome because most restaurants don’t make it, but they believed in me. Do you/did you have other ideas of businesses you want/wanted to start or that you think someone else should start? Any that you’d be willing to share? I’m actually in the process of developing something else, but I don’t know if it’s going to work. I want to have a vegetarian food truck. Vegetarian food is my passion – I love to cook it, and I love to eat it. I didn’t want to open another restaurant; it’s too much overhead. So I am in the process of pursuing it, and we’ll see what happens. What’s the best thing about owning a business? The best thing is having complete creative license. I get up and go to work; I’m in my 13th year. I go to work every morning and love what I do. I find that owning a restaurant is like having children – it’s the best thing you’ll ever do, and it’s the worst thing you’ll ever do. It’s that extreme thing all in one. I am so thankful that I get to do what I do. It’s so beautiful and yet so hard. You do it because it’s your passion; there’s nothing else I’d rather do. I would have been bored as a counselor. As a recovering addict, I need an edge in my life, and I need a challenge. And this is a challenge. It’s never easy, but I guess this is what I like. Any failure or hardship that you’d be willing to share? I don’t believe in failure. I’m a risk taker by nature. I’m telling you, over the past 13 years there have been so many times where my restaurant was two breaths away from shutting down. I’ve been to the edge so many times… it’s just part of being in business. And I’m sure that any business owner who is honest with you will tell you that. It’s always been hard, and it’s always been a struggle. What we did at the little location [Mary’s Of Course]: it was tiny, off the beaten path; it was crowded, the a/c never worked… it was a magical phenomenon what happened there. No matter what happens, I know that I was successful because we took a tiny corner spot and had lines out the door. We were in Southern Living! There have been so many unexpected things, and it’s so wonderful. So yes, I’ve had many hard times, but so many unexpected things have happened, too. I see obstacles as a challenge. As long as they don’t lock me out, I am going to keep coming to work every day. You just have to be tenacious and keep going. Woody Allen said something I’ve never forgotten: “90% of success is just showing up.” No matter what, you get up, get in your car, and do your best. Every day I go, I am thankful. I do the best job that I can and put my heart and soul into it. What’s the best piece or two of advice you would give to entrepreneurs just starting out in the restaurant business? Ask them: 1) Have you ever worked in a restaurant? If they say no, I tell them to go work in a restaurant for five years, in every type of business. People think it’s a glamorous job – it’s not. It’s just plain old hard work. It’s hot in the kitchen, you have to deal with angry customers, and people want money. Nobody understands how it changes when it’s your responsibly. You’re responsible to the city and your partners. Every plate of food that sits in front of a customer… I am responsible for every part of that – the music, the food temperature, etc. My name is on the door, and people associate this business with me, and it’s on my shoulders. So you better have some pretty big shoulders, because it’s a lot of responsibly. Don’t forget about it when you walk out the door, either. It’s with you 24/7. I’m a little bit of an insomniac, and sometimes I’ll wake up and write down ideas and new menus. The second question I ask people is if it’s their passion. If you are looking to make money, then owning a restaurant is the wrong path. What do you like best about owning a business in the Triad? Winston-Salem is a city, but it’s a small city. I feel like we were ground breaking 12 years ago. I really like being down on Trade Street now. We have a real tight-knit community in the Arts District; we are all really supportive of each other. My customers are loyal to me. Wake Forest is my number one supporter. There is also Salem College, the School of the Arts, Winston-Salem State, and the community in the Arts District. We also have the working people who come down to eat. Winston is filled with real friendly people. It’s a good place to have a business. What is your biggest challenge? Right now, especially in this economy, it’s keeping enough people coming in to pay the bills. That’s challenging, keeping all that stuff going forward. People don’t know how much goes on behind the scenes just to keep the place open. There’s so much stuff – the insurance, payroll taxes are huge, to getting someone to come clean the grease trap. We don’t get corporate tax breaks. The city says they want small business, but I don’t think they look at how hard they make it for us with regulations. It’s really difficult. The second challenging thing is dealing with staff issues. But the number one challenge is the financial aspect. Anything else you’d like to share? I hope people understand, and this is definitely something that’s come to the forefront: people in our communities need to support local food, which has always been close to my heart because I’m an old hippie. It’s so much better for your body and spirit. They need to support local businesses, no matter if it’s food or a store. If we don’t support these local businesses it’s going to be Applebees and McDonald’s. I wish people would stop shopping at these corporate businesses, but I don’t think it’s heading that direction, especially in the suburbs. Keep our cities live, interesting, and local. We met 26-year-old Vansana Nolintha, owner of Bida Manda in an earlier post. Now, he talks to us about his Laotian restaurant, including how created a destination restaurant filled with culture, food and community. Did you always want to start a business? No. I went to N.C. State for chemistry, and I studied design. After that I went to Europe and got a Master’s degree, so, academically, it wasn’t what I planned. I’ve traveled a ton – to over 30 countries – so I never thought I would settle down in one place. But after I finished at Trinity College, I came back to Raleigh and knew it was a place I wanted to settle down. And now I think there is something wonderful in immersing yourself in a community. I knew I wanted to do something with people, my Laotian past, and my academic history. Those three elements were the heart of my studies. And it just happened that Bida Manda is the manifestation of all of that. I get to be with people on an everyday basis; I enjoy hosting and telling my stories. I would be lying if I said opening a restaurant wasn’t a part of the plan… it just wasn’t part of the plan now. The family that my sister and I lived with in Greensboro had restaurants. So I was working in restaurants and hospitality – it has always been a part of my life. In Laos, my parents had a guest house where they were constantly hosting people and having people drop by. I always thought when I was older, like 40 or 50, that I would open a restaurant or do something with culture and food. But if I didn’t do it now, Bida Manda would always be a dream. When the idea started, people jumped on it and started nurturing it until this place came to be. It truly has become a community effort; every single element is hand-crafted. There’re very few things that can connect people on an intimate level very quickly, and I think food is one of them. One of my favorite things is watching people’s faces when they have Laotian food for the first time. Seeing their discovery is something that keeps me going every day. Bida Manda has become that for people, where they discover something new – whether it’s a new culture or taste. And we want Bida Manda to always be that for people. Do you/did you have other ideas of businesses you want/wanted to start or that you think someone else should start? Any that you’d be willing to share? I think the food truck industry needs to grow in Raleigh. I think downtown, especially, is on the edge of becoming one of the best downtowns in the country. One of its limitations is the food truck industry. It’s not something I would do, but I think someone should. It brings such a diverse community to downtown. Food trucks enable young entrepreneurs to take what they believe in and run with it. It’s not as intimidating as running a restaurant. What’s the best thing about owning a business? That you are responsible for your own success and failure – you really can craft your life. Working for yourself allows you to be very intentional about the choices you make. I think it’s not new to me because I’m a designer, but when you stand in front of a design and fully hold yourself accountable to the final product, you are accountable. Owning a business is the same in the sense that you are responsible. There’s something empowering about that. Any failure or hardship that you’d be willing to share? We did not anticipate to be so busy so early. Therefore, we did not put the infrastructure in place to handle that kind of traffic. So the first couple of weeks were very, very challenging. We were understaffed and under-prepared management-wise. But we have the best team, and everyone at Bida Manda sees this not just as a job, but also as a project, so people stuck with it. After five weeks, we feel like we have a system. And we are just so thankful to have that following. The restaurant industry is scary, and we are grateful every day that the community opened their hearts to us and gave us a shot. What’s the best piece or two of advice you would give to entrepreneurs just starting out? Just be very intentional about time: don’t rush; think everything through. They need to ask themselves why they want to do what they want to do. And write it out. One of the biggest resources was our business plan. Our plan wasn’t so much about income or cash flow in a given month. We identified what we wanted to do and how this place should feel. The more meaningful the business plan becomes, the more you have something to rely on. Every day has tons of decisions. If you don’t have a solid business plan, you can easily go astray from your original vision. We go back to our business plan, and we make decisions that go beyond cash flow. What do you like best about being a part of the food community here? I think people around here appreciate when restaurants are focused. And when I say focused, I mean not only about their genre but the ingredients that they use. Some places have two or three products that they take pride in. It’s like older restaurants that used to take pride in that. Our community really appreciates that. If you have good, honest products, people will appreciate it. What is your biggest challenge? I think because we are one of the first Laotion restaurants in the country, we have this opportunity to be a cultural investor for Laos and for the Laotian. Besides offering great food and great service, we have to be graceful and gentle about the product we are serving. It’s not just selling a dish, it’s telling a story to people who know very little about our story. Anything else you would like to share? We are just so thankful every day. I’m 26 years old; my sister just turned 25. It’s incredible that we have this much love and support, that people love us and trust us. Investors trusted us. Customers come and open their hearts to this new project. Especially within our community – this size – that a humble idea can turn into this business. It’s a direct reflection of what this community is, and what the Triangle is about. 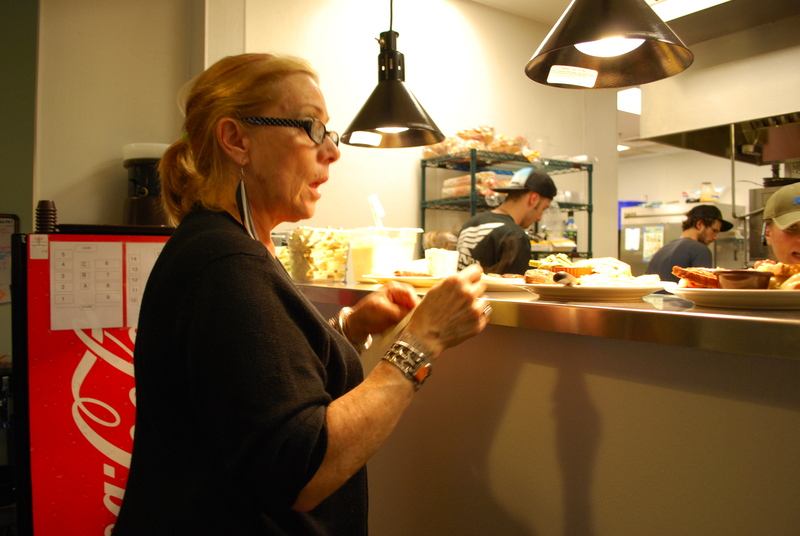 Mary Haglund, owner of Breakfast of Course (Mary’s, Too!) in Winston-Salem, loves to make people happy, and it shows at her restaurant and in her cooking. We asked her about her love of food, people, and North Carolina. Later this week, we’ll post an honest discussion we had with Mary about the ups and downs of being in restaurant business. Occupation: Owner of Breakfast of Course (Mary’s Too!) in Winston Salem. Where are you from? Gary, Indiana. Same town Michael Jackson was born in, but I was born a little before him. When did you move to North Carolina? Let’s see, I moved to North Carolina about 34 years ago from Indiana. What do you love best about North Carolina? Well, I’ve been all around the world and did a lot of moving in my life. I came here and it was a beautiful place. Where I am from is flat, but there are hills here. Here, you are four hours from the beach and four hours from the mountains. It’s got everything, especially Winston Salem, which doesn’t have big city problems. North Carolina and Winston Salem – I guess it was a love affair. What type of music do you listen to when you’re cooking in the kitchen? Jazz, I am a one hundred percent jazz girl. I like the Blue Note Years and some modern stuff. Top 5 favorite foods? (anything goes) (1) I LOVE really good Mexican food. Not the general Americanized stuff. Along with that, New Mexican food. (2) Curries and Thai food. (3) Love, love, love really good vegetarian food. Creative vegetarian food. I don’t eat a lot of dairy, even. The older I get, I just have to eat lighter food. 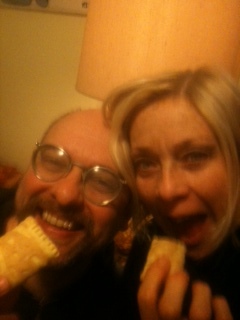 (4) I love Italian food. (5) I love Mediterranean food. What is your comfort food? My number one is toast. Toast is such a comfort food, especially with a cup of tea. My favorite thing to cook is soup. I could live for the rest of my life with really good soup. I make all the soups in the restaurant; they are all homemade. Are there any foods you won’t eat/try? I hate okra. I’m not Southern, and I’ve just never been able to get used to it. It’s slimy. I’ve developed a taste for a lot of Southern things, but that’s just not one of them. Also, I’m not French and I just won’t eat a lot of brains. I don’t like it. What is the last memorable meal you’ve eaten recently? Quite frankly, I had a great meal last night. I cooked for my (middle) daughter and two of my three grandchildren. It was total comfort food. We had BLTs with tempeh bacon along with mac and cheese and applesauce, and it was just really fun. The ingredient you currently can’t stop using is: There is an ingredient that I cook with all the time, and it is the New Mexico Hatch Chiles. I get them imported from a woman in Santa Fe. They have such a specific flavor because they are grown in that Mexican climate. The chiles’ combination of peppers are just beautiful. That’s why people get addicted to my different chilis. You have a day with absolutely no obligations. How do you spend it? I have days like that, which are rare, of course, in this business, and I don’t get to be home as much as I like. My husband, three dogs and I are renovating an old home from the 1920’s, and it is my sanctuary. I love hanging out at home. We just hang out, watch TV, work in the garden… it’s very relaxing. What do you cook at home that you never cook at the restaurant? I don’t think there’s much of anything because my food is pretty much integrated. I can’t really think of anything. The food we make at the restaurant is pretty reflective of food that I make at home. What are some cooking challenges or techniques you would like to tackle? Yes! my grandmothers: they were a big influence as far as cooking, and they made the most beautiful pie crusts. My life goal is to make a perfect pie crust before I die, and I’ve tried my whole life. Dough is one of those things where it’s all by feel and you have to know it’s perfect. Who is one person you’d love to cook with? Right now, because I love Mexican and New Mexican Food so much, I’d love to cook with Rick Bayless (the guy who does Frontera Grill), just so I could learn. It’s not hard to miss Top of the Hill Restaurant and Brewery on Franklin Street in Chapel Hill. The restaurant, located at the corner of East Franklin and Columbia Streets, has become an iconic part of the quintessential college town. 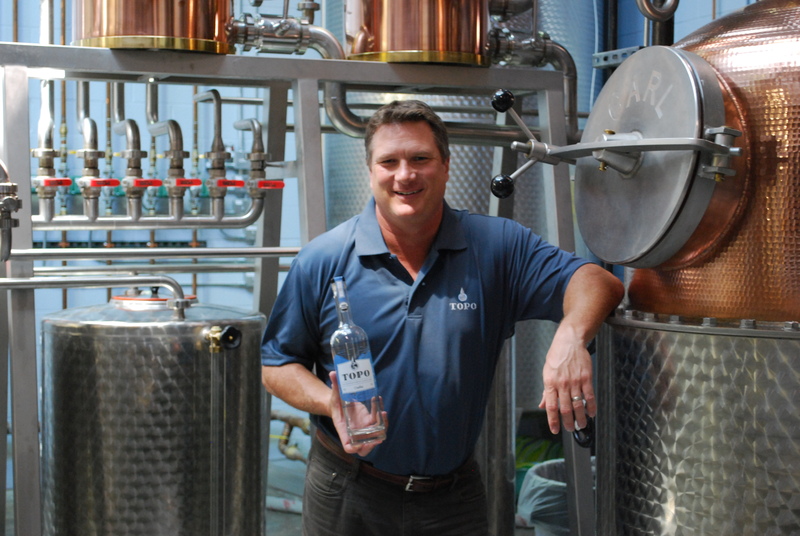 Top of the Hill’s proprietor, Scott Maitland, recently launched a new business several years in the making, He and his staff are producing vodka, gin and whiskey at TOPO Distillery. The distillery, located on West Franklin Street, boasts world-class equipment, and the spirits are made with local, organic ingredients. We talked with Scott about entrepreneurship and his venture, but first we’ll get know him better. Check back later this week to learn more about Scott and TOPO, and about Esteban, TOPO’s spirits guide. Occupation: Owner of Top of the Hill Restaurant and Brewery, and now TOPO Distillery. What is your hometown? Chapel Hill, N.C. When did you move to North Carolina? I moved to Carolina 20 years ago, but when I was 15-years-old, I knew that I wanted to live in the South. I was lucky enough to go to West Point and then, after I got out of the army, I got a full scholarship to law school at Carolina. I’ve been here ever since. What do you love best about North Carolina? Do you have a couple of days? I like the people, the culture, the energy – it’s aggressive but hasn’t forgotten its past – the beautiful topography and the location itself. I immediately felt at home. And then I really loved being here and wanted to stay. I love Chapel Hill and Carrboro particularly, but I also love the state of North Carolina. What type of music do you listen to when you’re cooking in the kitchen? Last night I was cooking to Chatham County Line. When we are distilling we do different things. It’s eclectic. Top 5 favorite foods? (anything goes) (1) I love my mom’s cooking. I don’t really like it in general, but my mom’s corned beef is fantastic. She makes unbelievable meatloaf. I’m a comfort food person. I appreciate food, but when I think of friends and family, I think of comfort food. I try to recreate dishes that I grew up on, but with a modern twist. (2) Truffles. I am kind of mad about truffles. (3) Scallops. (4) Chocolate Chess Pie – again my mom’s cooking. At the end of the day I like foods that bring back memories of friends and family. (5) Mexican Food, specifically tacos al pastor. What is your comfort food? Putting the distiller twist on it, I’m not sure it’s food. A nice IPA or gin martini will typically cure all. Are there any foods you won’t eat/try? No. So, it’s weird because I never used to eat Brussels sprouts until about last year. But I think I’ve had them three nights in the past seven days. What is the most memorable meal you’ve eaten recently? My mother-in-law has a huge garden, and she brought a whole bag of tomatoes, peppers, cucumbers and onions. And I made this great salsa/relish out of it all. I served that on top of salmon that my wife and I poached and paired it with fingerling potatoes. And then my mother-in-law also gave me fresh parsley, which we crushed with kosher salt for the potatoes. That was it. Simple. Nothing really fancy, and we paired it with a nice Vouvray. We sat on our back porch – we have a beautiful backyard – and enjoyed. The ingredient you currently can’t stop using is: I just got this grinder jar of everyday seasoning from Trader Joe’s. It’s got coriander… I find myself putting it on everything. You have a day with absolutely no obligations. How do you spend it? Having two kids (3 1/2 year old Kailey and 20 month old Austin), I don’t know if I can remember those days. But I think that I would definitely play a round of golf. And come back and cook dinner with my wife and have cocktails and dinner on our back porch. What are some cooking challenges or techniques you would like to tackle? My challenge in the TOPO Distillery is all about being local and organic. I’m really trying to figure out the local supply chain for my botanicals found in the gin. Specifically, I’m trying to find a way to source local juniper berries. It’s ironic because all the botanists believe that the juniper berries originated in this area. I want to create some kind of community harvest where people get it out of their own yards. But then everyone is concerned about organic certification. So, at any rate, these are the challenges of making a local gin. We also want to make a rum out of sorghum. Who is one person you’d love to cook with? I think it would be fun to cook with Garrett Oliver from Brooklyn Brewery. He is the author of Brewmaster’s Table. Seems like an interesting cat. Soon enough he was moving his wife and three cats to New York City, where he started culinary school. After working in a catering kitchen and a gourmet sandwich shop, he took a part-time job at Murray’s, where he discovered his love for high-end cheeses. Did you always want to start a business? Probably not. I mean, I had the idea that I would like to own my own cheese shop. While living in New York, I was working at this small cheese complex, but when I moved here, I found there was nothing like that. All the cheese counters were in these large places, and I don’t like working at big, corporate places. I was either going to open a shop or get out of the cheese business altogether. But selling cheese is something I’ve proved to be good at. Do you/did you have other ideas of businesses you want/wanted to start or that you think someone else should start? Any that you’d be willing to share? The one idea that I had that seems like it will be happening is an old-school butcher counter. People come in here and say that we have cheese and bread here in Durham, but no old-school butcher. There is a place that is opening that is going to be a butcher counter and sweet shop. They’ve been doing events at The Cookery recently. I don’t think they have a space yet, but they are at least making motions to make that happen. I would also love to see an actual neighborhood grocery. I know the Durham Co-Op is supposed to be open in forever and a day. There are a lot of people that shop here and work and live in downtown Durham, but there’s nothing downtown if you need to get produce. When we first opened, people would come and ask for vegetables, but I said no – we are sticking to meats and cheeses. What’s the best thing about owning a business? One of my favorite things is not only helping customers but also meeting a lot of cheese producers. I would say that is my number one favorite thing. And meeting all the people whose products I carry at the shop. Then, also being a business owner. Any failure or hardship that you’d be willing to share? The biggest hardship for this place was definitely finding start-up money. Food businesses are inherently risky. We don’t have a lot of collateral, so we weren’t able to get bank loans. We had to get very creative with funding the business from the start. You’re supposed to start with a year of capital, and we definitely didn’t have that. We’ve been open a year now and it’s all thanks to our customers and the people around here that have come to support this type of business. Our current hardship: balancing prepared foods and the cheese counter. We are separating these. I was recently in delis in New York examining how they did it. They have different stations: cheese stations and prepared foods stations. 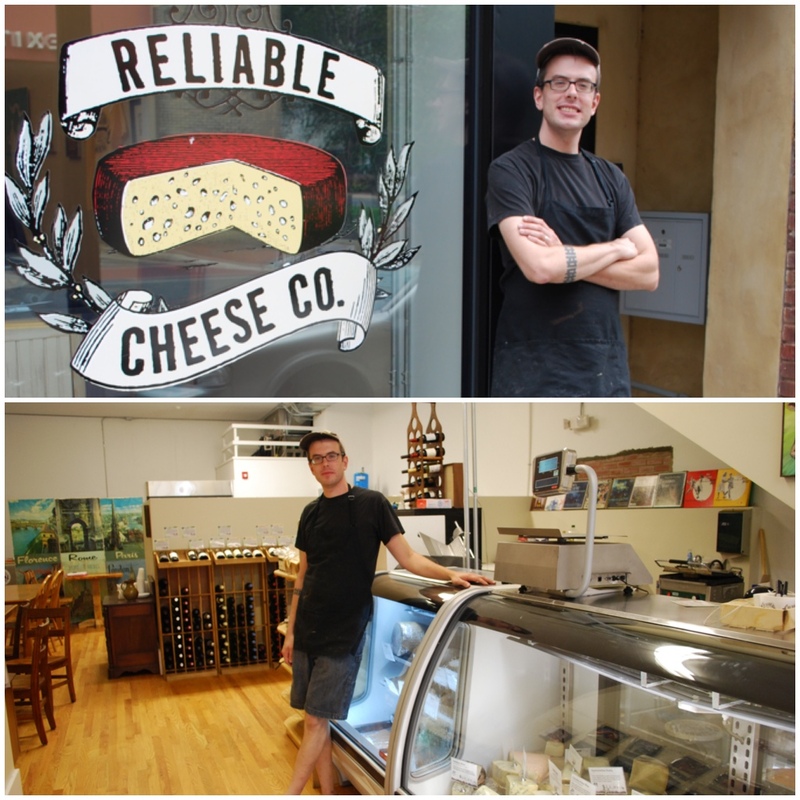 Here at Reliable Cheese, it’s tough because we were doing everything on two small cutting boards. The first time people said they wanted tables, we said no. But at the end of the day, it’s hard, if not impossible, to make a business work off of just cheese sales. There’s very little mark-up for a perishable product. Prepared foods like sandwiches are great for us; it’s what keeps the business going when cheese sales aren’t as great sometimes. If that means adding a few tables, we will add a few tables. What’s the best piece or two of advice you would give to entrepreneurs just starting out? Shoot. I mean, a lot of people come in here from other businesses, and I’ll talk to them and offer advice. I think probably the thing I’ve learned with the shop is to be flexible. Your perfect vision of what you want is probably not going to happen. You have to adapt to what you want and what people expect from you. And a good space is always important. We purposely chose this space because it was bigger than what we needed so we would have room to grow. I’m really we did that. What do you like best about owning a business in the Triangle? In Durham, specifically, it has been the support of all the local business owners. Before we opened, Fullsteam agreed to start offering our cheese plates. Phoebe from Scratch let us use our kitchen. Rue Cler helped me moved my deli case into the store. All the help form the other local business owners has been great. We are working with Dos Perros on collaborating. I really like the collaborative spirit. There’s not that sense of competition, but rather a sense that one of us succeeding is all of us succeeding. We know downtown Durham is on the upswing. As these new businesses come, their success is success for all of us. What is your biggest challenge? Just having enough time in the day. I’m looking into having a business manager. Right now, it’s just me, from filing taxes to selling cheese and working behind the counter. The hardest part is making enough time. I have to balance the time I spend here with seeing my wife and kids at home. I don’t see them as nearly as much as I’m used to. Things don’t get done as quickly as I’d like them to get done. Anything else you would like to share? It’s been a crazy experience for us in the year we’ve been open; I am continually surprised by the support we’ve received. After getting to know Mark Overbay in a previous post, we shift our focus to his business: Big Spoon Roasters. Once he became a regular selling his nut butters at the Carrboro Farmer’s Market, Mark began to expand his business. In recent months, he decided to leave his job at Counter Culture Coffee to pursue Big Spoon full time. Big Spoon Roasters currently sells a variety of nut butters, energy bars, roasted peanuts and, if you catch them at the right time, delicious baked goods and treats, like their peanut pecan oatmeal cookies. The company is named as a tribute to his dad, Gary, who earned the nickname of Big Spoon when Mark was six years old. One day, Mark found him in the kitchen eating peanut butter straight from the jar with a tablespoon. Mark quickly shouted “Big Spoon” and the name stuck. It’s Gary’s nickname to this day. And now Big Spoon has become more than just a nickname; it’s Mark’s passion and livelihood. Did you always want to start a business? Yes, I’ve known it for a long time. Part of it was a discovery process (the business side), the other part of it is I’ve always loved creating things – especially with food and cooking. For a long time I wanted to have my own food business, I just wasn’t sure what it would be. Would it be a product I make or would it be a restaurant? It thought about both a lot. Do you/did you have other ideas of businesses you want/wanted to start or that you think someone else should start? Any that you’d be willing to share? I think that there should be more food business incubator kitchens; that was a business idea I had to do here. The Cookery has mastered it, and it’s fantastic. There are only a dozen of these incubator kitchens around the country. There are many, many opportunities to start businesses like The Cookery across the United States. I also have a lot of restaurant and store ideas. Exotic fruit importing. In America, we eat a lot of fruit, but we eat very few types of fruit. There are thousands, literally thousands, of amazing fruits in the world that aren’t imported. The varieties of bananas around the world alone would astonish you. What’s the best thing about owning a business? Owning a business is the best and worst thing. You’re constantly making decisions, driving the decisions. It’s wonderful to be able to act on your creative impulses and see them come to life. But at the same time, you also feel the pressure of succeeding when it’s your investment on the line. Any failure or hardship that you’d be willing to share? The biggest challenge is getting people to think about peanut butter beyond the stale, sweet paste that we’ve all become familiar with. Instead, people need to think about peanut butter as a fresh, hand-crafted food experience. What’s the best piece or two of advice you would give to entrepreneurs just starting out? Believe in your product. Be courageous. What do you like best about owning a business in the Triangle? The diversity and curiosity of the community is great. People here are generally excited and willing to try new things. And there’s a great network of entrepreneurs. What do you like best about being a part of the food community here? I’m constantly inspired by original farmers, chefs, and food artisans in the North Carolina food community. The energy and passion around local food is as strong as anywhere in the world – and I say that without any hyperbole. I think people, particularly in the food community, are truly connected to agriculture, to where our food comes from, and they are interested in making that connection all the way to food lovers. That’s so important to the integrity of our food system. This area has shown a lot of leadership in that area for the rest of the nation. What is your biggest challenge? Right now it is production capacity. All the nut butter is made – roasted, ground, jarred – by me. If this business is going to succeed, we will need to make more nut butter in a short amount of time. As you wander the Carrboro Farmer’s Market on a Saturday morning, you can’t help but notice Mark Overbay and his handcrafted nut butters. Today, we want to introduce you to Mark, the man behind Big Spoon. 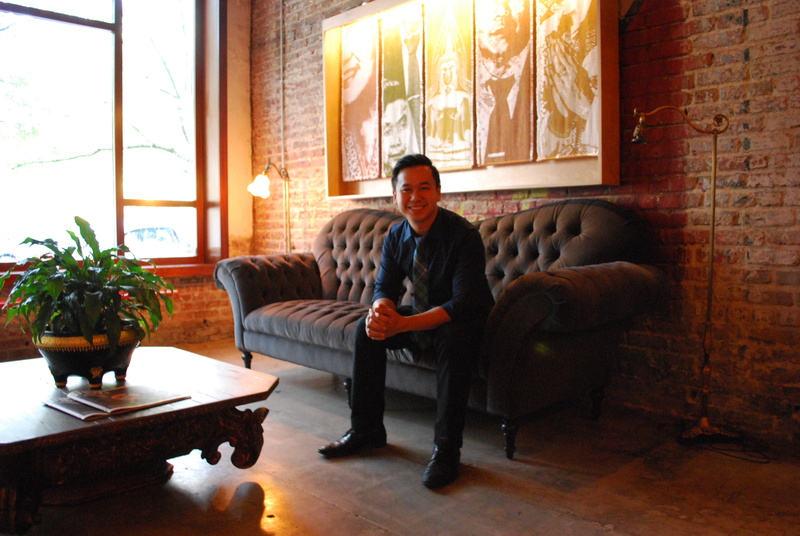 Later this week, we’ll share more about Big Spoon Roasters and the story behind Mark’s business. Occupation: Owner of Big Spoon Roasters. Moved to North Carolina: In 2006 from Washington D.C.
What do you love best about North Carolina? That’s tough… There’s a lot a good stuff here in North Carolina. It’s difficult to answer, but I love the people, the climate, the music, the ocean, the mountains. I can’t think of anywhere else I’d rather live. What type of music do you listen to when you’re cooking in the kitchen? Well, I love music. My tastes are all over the place. Right now, I love the Black Keys, Gillian Welch, Hip-hop, Old R.E.M., and Louis Armstrong. My dad was a guitarist, and I grew up playing drums in our house. Top 5 favorite foods? (anything goes) 1) Black Twig Apples with Peanut Butter 2) Roast Chicken 3) Summer Tomatoes with Salt 4) GREAT coffee (it has to be great) 5) Collard Greens. What is your comfort food? Ice Cream – Specifically coconut milk ice cream with nuts and dark chocolate. Are there any foods you won’t eat/try? Not really – I was a volunteer in the Peace Corps in Zimbabwe, and moth larva was one of the local foods. I feel like most things here are pretty tame compared to that. For a long time in my life I had mayonnaise phobia, but once I had the homemade/restaurant versions, I came around. What is the most memorable meal you’ve eaten recently? When Megan, my fiancé, and I cooked dinner for my parents, we had Cane Creek Farm sausages on the grill with cabbage slaw – the cabbage was from Bluebird Meadows Farm – and pea shoots were from Four Leaf Farm. That was followed by Megan’s homemade peanut butter cups. The ingredient you currently can’t stop using is: Sea Salt. You have a day with absolutely no obligations. How do you spend it? I’d go on a run with Megan [pictured above] and our two dogs, Riley and Rioja. Then, brunch at Parker & Otis, followed by a bike ride. Probably then, I’d buy ice cream and go to a matinee movie. And then homemade dinner and dessert at home. What are some cooking challenges or techniques you would like to tackle? I’d love to master authentic Japanese sushi. It’s something I’ve never really done much of. Who is one person you’d love to cook with? I’d love to cook with my great-grandfather Woodrow Williams. Before he passed away, I was very close with him but I wasn’t really of cooking age. But he was a great cook, awesome in fact. He was sort of an improvisational Southern, American cook. He knew how to catch trout, clean it, and then fry it on the river bank. He also made amazing biscuits and fried chicken, and he could can any vegetable. He’s definitely an idol.